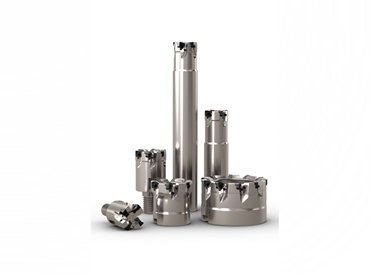 Leading manufacturer of high performance metal cutting tools, Seco Tools Australia presents the Seco Square 6-04, a compact square shoulder milling tool designed for productivity and cost efficiency in milling operations. Featuring six cutting edges per insert, the Seco Square 6-04 milling tool is ideal for small- and medium-sized milling machines. Seco’s latest addition to this milling tool range includes an M-geometry, reduced diameter shanks and one more shell end mill. The tool is used in general machining applications such as engine blocks in the automotive industry. Seco’s Square 6-04 range of cutters has brought the six-edge productivity of the bigger Square 6-08 down to the 20mm diameter range. Tapio Alatalo, product manager at Seco explains that 20-25mm is an important diameter range for cutters in this type of milling. The Square 6-04 therefore, complements the larger model as well as cutters with one-sided inserts. Each diameter of the cutter is available in two pitch versions, coarse and close, allowing the material removal rate to be balanced against stability for optimum performance in different applications. Square 6-04 is suitable for a number of methods including face, slot, side and plunge milling, both in roughing and finishing operations. Square 6-04’s inserts come with M-geometry in seven different grades with a focus on steel and cast iron, and include options for difficult-to-machine materials. The latest addition is a light cutting M-geometry for stickier substances such as soft steel and stainless steel.